At the turn of the last century, there was no television, no movies, no comic books, no paperbacks as we know them today. Some houses were wired for electricity, but it was still the era of gaslight. Horses were more common than automobiles, and in rural areas, outdoor plumbing was the norm. People worked long hours and six-day weeks, and they had relatively little time for entertainment. When they did, the most popular form was what you're doing now: reading. It was the start of the golden age of magazines, and "pulp"magazines, publications the size of today's National Geographic but printed on cheap newsprint, became a large part of the boom. Glossy magazines -- the "slicks" -- featured large numbers of photographs and advertisements, which required a costly coated paper stock. They were expensive to produce and, since advertising paid the bills, they had to sell in the millions, most of them by subscription. The pulps, in contrast, were cheap to produce, had few ads and no photographs, were printed on inexpensive paper, and sold most of their copies off the newsstands. At first, there was little difference between the fiction that appeared in the pulps and the slicks; much of it was by the same authors. If an author failed to place a story with The Saturday Evening Post, it might find a home in one of the Post's poorer cousins. With time and competition, however,the pulps began to feature more action stories, some of them wildly implausible -- a selling point for the pulp audience. The slicks, on the other hand, were reality bound. Their stories didn't stray far from home and hearth, while pulp stories frequently ventured from the Wild West to darkest Africa, or voyaged to the moon or Mars. The sensational fiction in the pulps was complemented by the flashy and arresting art on the magazines' covers, the images that characterized the golden age of magazine illustration. Initially, many of the artists whose work graced the covers of the slicks also illustrated the covers of the pulps: N. C. Wyeth (father of Andrew), Joseph Leyendecker, and Harvey Dunn, to name a few. Later, the pulps cultivated their own artists,whose canvases are now auctioned for tens of thousands of dollars, and whose work you can see reprinted in this issue of Zoetrope: All-Story. The man who started the pulps was Frank A. Munsey, a farmer's son who managed the Western Union office in Augusta, Maine, and then decamped to New York City to find his fortune in publishing. His initial attempt, a magazine for boys titled The Argosy, was on life support for its first fourteen years. To keep it afloat, Munsey became a workaholic who acted as editor, ad salesman, writer (he wrote much of the fiction he published), and publicity agent, and probably swept out the office on Saturdays. Munsey finally struck it rich when he invented the ten-cent magazine -- Munsey's, a slick -- a revelation in a country where the average weekly wage was seven dollars, and most slick magazines cost twenty-five cents. But Munsey's other magazine, The Argosy--which had become a cheap imitation of the average slick, complete with essays, badly printed photographs, and some fiction--didn't sell, even at ten cents. Desperate, in 1896 Munsey turned it into an all-fiction magazine printed on low-grade pulp paper, stripping it of the articles and most of the pictures. Fiction, it turned out, was what the readers really wanted. The magazine's circulation doubled and redoubled. With the profits from Munsey's and The Argosy, Munsey chainsawed his way through the newspaper jungles of New York, buying, killing, and combining papers with the ruthlessness of an early Rupert Murdoch. When he died, he left most of his fortune of $40 million to the Metropolitan Museum of Art, an institution that Munsey's many enemies claimed he had never entered. The Argosy had the all-fiction field to itself for seven years before a successful competitor, The Popular Magazine, showed up in 1903. Munsey reasoned that if there was room for two all-fiction magazines, there might even be room for a third. 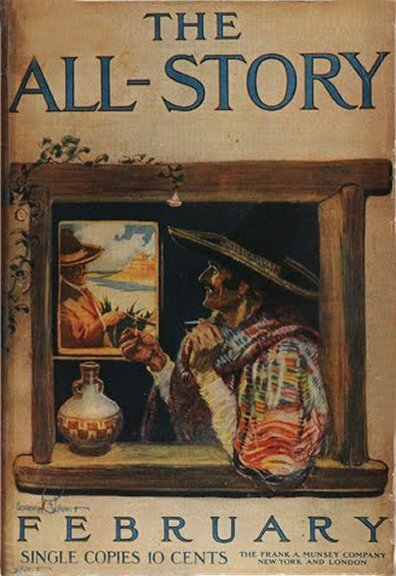 The first issue of The All-Story--the magazine that inspired Zoetrope: All-Story's name--was published in January 1905. The All-Story (later retitled All-Story Weekly) ran until 1920, an all-fiction pulp-paper magazine that sold for the bargain price of ten cents for 192 pages. All-Story was never the top seller in its field, but a credible claim could be made that it was more creative and had a more solid literary reputation than its competitors. Edward J. O'Brien's annual collection of the Best Short Stories for 1918 reprinted two from All-Story ("A Simple Act of Piety," by Achmed Abdullah, and "The Gallowsmith," by Irwin S. Cobb). That same year, thirty-seven other stories were given Honorable Mention, more than any other all-fiction magazine in America (and by that time there were quite a few). Like the editors of other magazines, the editors of All-Story were always on the lookout for a storyteller to rank with Kipling and Wells and Doyle. They finally found one in 1912. Edgar Rice Burroughs was thirty-five years old, had a wife and three children, and was trying to make a living as manager of a pencil-sharpener company. Burroughs was miscast as a businessman--he much preferred to be outdoors and had worked on a ranch in Idaho at age sixteen. Seeking adventure, Burroughs had tried in vain for an army commission after several years at the Michigan Military Academy and a stint in the army cavalry. He was turned down by Teddy Roosevelt's Rough Riders during the Spanish-American War. Burroughs had a rebellious nature and was either fired from his white-collar jobs or quit suddenly, even when he seemed to be doing well. On the side he was a fairly accomplished cartoonist and illustrator and occasionally wrote satires and poems. One day in 1911, while waiting for his pencil-sharpener agents to return from their unprofitable rounds, he started scribbling in earnest. 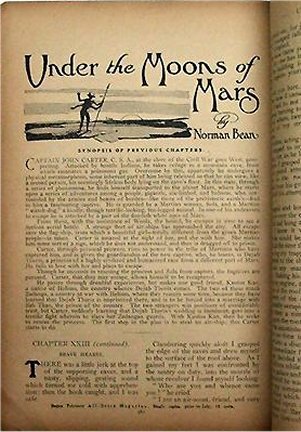 His first serious attempt, published as Under the Moons of Mars, was a wild and woolly tale of a Confederate soldier who has taken refuge from Indians by hiding in a cave and somehow "wills" himself to Mars, the tiny red star he can see from the cave entrance. What was important was not the trip but the destination. Burroughs's portrait of Martian life was meticulously thought out and thoroughly believable. Burroughs had sampled every all-fiction magazine and was most impressed by The All-Story, which he decided was the most logical home for his first novel. He duly submitted it, and after making several requested changes, Burroughs was paid $400. He had finally found his profession. The story was serialized in All-Story under the pseudonym of "Norman Bean." Burroughs, still convinced that his future lay in business, was worried that friends and employers would consider him more than a little odd if they read the story with his real name on it. Primarily for protection and partly as a gag, Burroughs wanted the byline to read "by Normal Bean." A zealous typesetter corrected the "typo," much to Burroughs's dismay; he decided to use his real name the next time out. The readers were wildly enthusiastic, and the editor of All-Story suggested that his new discovery try a medieval novel. Burroughs considered his suggestion a command, and within weeks finished The Outlaw of Torn. The editor rejected it, suggested revisions, then rejected it still again. (Burroughs sold it to another magazine several years later.) A depressed Burroughs was now uncertain about a career as a writer, even though he admitted that he liked the process. The editor's next suggestion was a sequel to Under the Moons of Mars. Never had a magazine gotten so much for so little. "I was born there. My mother was an Ape, and of course she couldn't tell me much about it. I never knew who my father was." In 1912, it was impossible to read that last paragraph without tears springing to the eyes. Despite the exotic setting and the derring-do that takes up most of the pages, Burroughs had been wise enough to frame the tale as a love story. In Burroughs's stories, unlike those of his peers, women always played a major role, stereotypical though that role may have been by modern standards. Burroughs, who had so often failed at business, turned out to be a very smart man with a dollar when it came to his own stories. He retained the book rights to the tales he wrote and later claimed he had sold some thirty-five million books in North American alone. He published fifty-nine books in his lifetime, twenty four of them about Tarzan, who also inspired a long and successful comic strip, and a long-running movie franchise. (The latest film is Disney's Tarzan, released in 1999 to critical acclaim.) In the early thirties he founded his own publishing company. At the time of his death, in 1950, Burroughs had an estate estimated at $10 million--not bad for a man who once pawned his wife's jewels to feed his family. He even achieved his dream of being involved with the military at age sixty-seven, when he became the oldest war correspondent in the Pacific Theater during World War II. Though Burroughs also wrote novels set on Mars, in the Earth's core, on Venus, and even in Hollywood, his most popular creation was Tarzan. Decried by generations of schoolteachers as the epitome of trash, Tarzan also had his defenders. 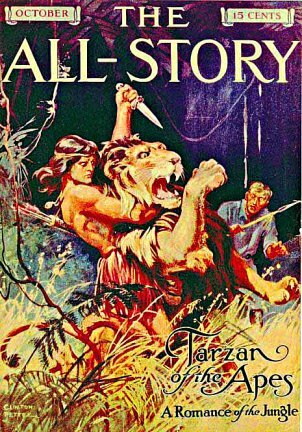 In 1968, Saul Malof, writing in The New York Times Book Review, took a revisionist look at the short stories in Jungle Tales of Tarzan: "There in the dark continent of the mind . . . Tarzan comes alive, opens up, breathes. . . . This is the immortal Tarzan of the imagination--alone and desolate but also free, doomed to swing for eternity through the middle terraces between heaven and earth . 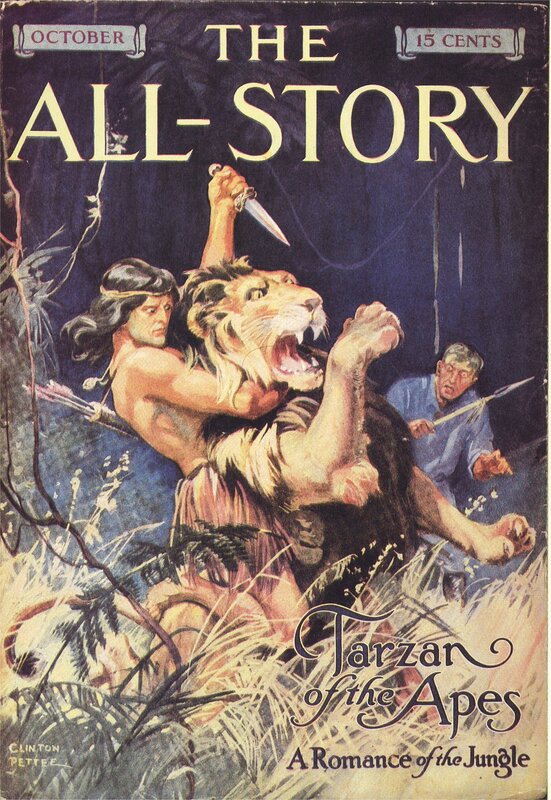 . ."
Although Burroughs occasionally defected from All-Story, he returned for the last time with Tarzan and the Valley of Luna, serialized in the issues of March 29 through April 17, 1920. Unfortunately, both paper prices and production costs had skyrocketed, leaving All- Story on the verge of collapse, and even Burroughs couldn't save the magazine. Munsey had reduced the price of Argosy (now a weekly) and All-Story earlier and both sold for ten cents, the cheapest of all the pulps. Perhaps Munsey chose to keep the price so low because he feared raising it would give away his competitive edge. Munsey headed off the impending crisis, as he had with so many of his newspapers, by combining the two magazines as Argosy All-Story Weekly. 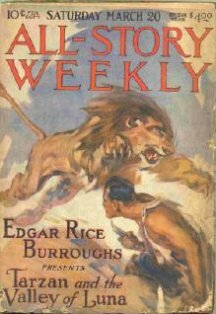 The last issue of All-Story was published on July 17, 1920. It wasn't the end of the pulps (in the thirties, the newsstands groaned with hundreds of titles) but it was definitely the end of the first generation of pulp magazines. The next generation of pulps was made up of more specialized magazines, such as Detective Story, Western Story, and Love Story Weekly. When the pulps finally died out completely in the mid-fifties, many of the authors went on to write for television shows such as 77 Sunset Strip, The Adventures of Wild Bill Hickok, and The Lone Ranger. And the spirit of the pulps lived on in movies such as Raiders of the Lost Ark and Star Wars. Zoetrope: All-Story has also done its bit to preserve that spirit by presenting "classic reprints" of seminal pulp stories. Robert Bloch expanded his story "The Real Bad Friend" (first printed in Mike Shayne's Mystery Magazine, February 1957) into the novel that Alfred Hitchcock filmed as Psycho. And Arthur C. Clarke's "Sentinel of Eternity" (10 Story Fantasy, Spring 1951) was adapted into the script for Stanley Kubrick's 2001: A Space Odyssey. In the first issue of Zoetrope: All-Story, publisher Francis Ford Coppola announced that the magazine's choice of stories would be based "on the voice of the writer, the quality of the writing, the luster of character, and depth of plot, in the hope of illuminating contemporary life." Frank A. Munsey, the founder of the original All-Story, would have understood those sentiments completely.